We are, all of us, abandoning taxonomy, the ordering and naming of life. We are willfully…losing the ability to order and name and therefore losing a connection to and a place in the living world. No wonder so few of us can really see what is out there. Shattuck, S. 2008. Australian ants of the genus Aphaenogaster (Hymenoptera: Formicidae). Zootaxa 1677: 25-25. ABSTRACT: The Australian species of the myrmicine ant genus Aphaenogaster Mayr are revised. Eight species are recognised, four of which are described as new. The species include barbara sp. n., barbigula Wheeler (for which a lectotype is designated), kimberleyensis sp. n., longiceps (Smith) (with its newly recognised synonym, flava Emery), mediterrae sp. n., poultoni Crawley, pythia Forel (for which a neotype is designated) and reichelae sp. n. Aphaenogaster is widely distributed across eastern and southern Australia (except Tasmania), with isolated populations in northern Northern Territory and northern Western Australia. Species occur in a range of habitats from rainforests through open woodlands and can be of significant economic importance because of damage caused by their nests. Masuko, K. 2008. Larval stenocephaly related to specialized feeding in the ant genera Amblyopone, Leptanilla and Myrmecina (Hymenoptera: Formicidae). Arthropod Structure and Development. 37: 109-117. ABSTRACT: Larvae of the ant genera Amblyopone, Leptanilla and Myrmecina have unusually minute crania. This characteristic is here termed stenocephaly. To study it in detail larvae of the three genera were examined morphometrically and histologically in comparison with other non-stenocephalous larvae of the genera Cryptopone and Manica. The stenocephalous larvae are very specialized, in that their supra- and sub-esophageal ganglia are entirely displaced into the anterior thoracic segments, apparently as a consequence of the small cranial capacity. In Amblyopone and Leptanilla the small cranium appears to facilitate group feeding by a large number of larvae on the whole, intact bodies of the specialized centipede prey characteristic of these genera. In Myrmecina, the small, elongate head adapts the larva to consume the contents of the partly opened bodies of oribatid mites, which are the specialized prey of this genus. Therefore, stenocephaly seems to be a larval morphological adaptation facilitating specialized predation in these ants. These morphological specializations by ant larvae, and active larval involvement in prey dissection are possible because ants rear the larvae without confining them in cells. Acellular nests, a universal feature in Formicidae, may thus facilitate larval adaptations of benefit both to the larvae themselves and to the functionality of parental colonies, allowing them more efficiently to exploit accessible prey through well-integrated cooperation between adult and immature individuals. Schlick-Steiner et al. 2008. Specificity and transmission mosaic of ant nest-wall fungi. PNAS 105: 940-943. ABSTRACT: Mutualism, whereby species interact to their mutual benefit, is extraordinary in a competitive world. To recognize general patterns of origin and maintenance from the plethora of mutualistic associations proves a persisting challenge. The simplest situation is believed to be that of a single mutualist specific to a single host, vertically transmitted from one host generation to the next. We characterized ascomycete fungal associates cultured for nest architecture by the ant subgenera Dendrolasius and Chthonolasius. The ants probably manage their fungal mutualists by protecting them against fungal competitors. The ant subgenera display different ant-to-fungus specificity patterns, one-to-two and many-to-one, and we infer vertical transmission, in the latter case overlaid by horizontal transmission. Possible evolutionary trajectories include a reversal from fungiculture by other Lasius subgenera and inheritance of fungi through life cycle interactions of the ant subgenera. The mosaic indicates how specificity patterns can be shaped by an interplay between host life-cycles and transmission adaptations. Last month, British myrmecologist Barry Bolton published the first ever global synthesis of the ant genus Technomyrmex. The tome describes 37 new species, including Technomyrmex fisheri from Madagascar, named after Brian Fisher of Antweb. I’m always keen to try out new taxonomic keys, so I tested Bolton’s out on several unidentified African and Australian species in my collection. As is nearly always the case with Bolton’s meticulous work, the key worked flawlessly. I only wish I had more Technomyrmex to key. Perhaps the most notable finding of the study, aside from the plethora of new species, is one that might upset the Pest Control folks. Bolton has discovered that the infamous White-Footed Ant, previously thought to be the single species T. albipes, is a complex of similar species, only one of which is T. albipes. In the long run, the knowledge that there are multiple pesty species in the group will better help us determine where they came from and how to control them, but of course in the short term these are the sorts of discoveries that make people hate taxonomists. Changing names makes literature retrieval more difficult, and it’s always tricky to have to remember a new name. The Technomyrmex causing problems in Florida can no longer be referred to as Technomyrmex albipes. It is now Technomyrmex difficilis. Perhaps appropriately, we can now call this pest the “The Difficult Ant”. In any case, it looks like this in the field. Source: Taxonomy of the dolichoderine ant genus Technomyrmex Mayr (Hymenoptera: Formicidae) based on the worker cast. Barry Bolton. 2007. 150 pp. Contributions of the American Entomological Institute Volume 35, No. 1. Huertas, B. and J. J. Arias. 2007. A new butterfly species from the Colombian Andes and a review of the taxonomy of the genera Idioneurula Strand, 1932 and Tamania Pyrcz, 1995 (Lepidoptera: Nymphalidae: Satyrinae). Zootaxa 1652: 27-40. The online journal Zootaxa has hosted the publication of 6723 new animal species since its inception in 2001, averaging over 2.8 new species per day. And that’s just a single journal- there are scores of taxonomy journals out there. Taxonomy is an old science, but it remains on the frontiers of biological discovery. Discoveries of new species on our little-known planet continue apace. 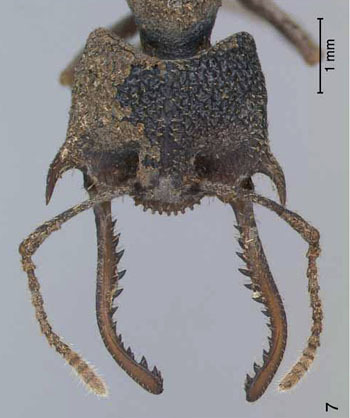 The two known specimens of the impressively toothy Mystrium maren were collected in 2001 in Indonesia, and Jochen Bihn and Manfred Verhaagh just published a paper in Zootaxa describing this ant and another new species, M.leonie. Source: J. H. Bihn & M. Verhaagh, 2007. A review of the genus Mystrium (Hymenoptera: Formicidae) in the Indo-Australian region. Zootaxa 1642: 1-12. *update* Lead author Jochen Bihn writes about the paper on Trophallaxis Blog.